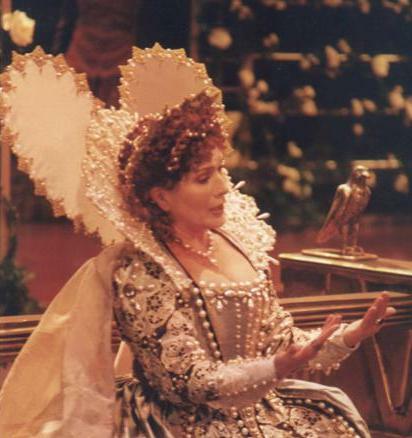 From Lady Macbeth to Tosca, from Handel to Respighi, from the Met to La Scala, Nelly Miricioiu has been conquering the operatic world for several decades. For twenty years she was a regular face on the Covent Garden stage, and her high-voltage performances, coupled with numerous titles in Opera Rara's bel canto catalogue, have made her into something of a cult diva. But a challenge which has long eluded the Romanian-born British soprano is a presence on the recital stage. At last, that's going to be corrected next week on Wednesday 20 May, when she sings her first solo concert at St John's, Smith Square. As is typical of this artist, the repertoire on offer is wide, combining Donizetti, Bellini and Verdi with the music of Romania, plus Ravel, Rodrigo, Lennox Berkeley and Meyerbeer. The first person who really helped her to gain status in this country was the much-missed visionary impresario Patric Schmid, who encouraged Miricioiu by featuring her in recordings and performances on his specialist Opera Rara label. She appeared in numerous complete recordings for Opera Rara, including Donizetti's Maria de Rudenz, Roberto Devereux and Rosmonda d'Inghilterra (the latter with Renée Fleming), Rossini's Ricciardo e Zoraide, Mercadante's Orazi e Curiazi and Pacini's Maria, regina d'Inghilterra, as well as several solo recital discs for them. 'It was the continuity that made a difference,' she explains. 'I think an artist like me needs a continuity to have the right kind of platform, because I'm somewhere in the middle: through my singing, my way of looking at my music and my career, I belong to a very old school of singers, and I follow the tradition of those people; but on the other hand, partly because of my age and partly because of my mentality, I'm very modern. The solution came from an unexpected quarter. For the last nine years, Miricioiu has joined the Chelsea Opera Group for an annual series of acclaimed concert performances of unusual operas. 'I found my home,' she says contentedly. 'I found a tremendous love and passion, not only for what I was doing, but in themselves. They were taking pride in their work, and I was amazed. We have a long-standing relationship now. 'It's not that I command what I want to do,' she assures me. 'I think I'm extremely fortunate to have Duncan Orr, who actually understands my voice. He was a fan of mine a long time ago – he saw my first performance in Edinburgh – so he said that when he first came to me, he couldn't believe his luck! 'But I needed a platform to be known in London. I'm British, for goodness' sake: do you know how few people realise that I'm British, that I'm married to an Englishman, that I live in England, that my son is English? It's crazy. I remember that Rodney Milnes happened to be in Paris reviewing I vespri when I took over at short notice, and in his review he wrote something like, "What is wrong with us British that we can't recognise that she is British? What's wrong with being proud that she's one of us?" I feel very sad about it,' she adds with obvious emotion. When I ask how she chose the programme, Miricioiu says that 'Most of it is simply because I love it. I also want to have a diversity. I am starting with Joaquin Rodrigo because it's stylistically very interesting: it's similar to a cappella singing, and I love that kind of thing. I do Donizetti songs, which are very operatic and belong to my bel canto. I try to mix things for the public's taste: I'm very melancholic as a personality, and I have a mad sense of drama. Most of the time, I love the death scenes – that's my excitement!' she jokes. The soprano explains that her childhood continues to cast a shadow over her personality and that by extension, this has influenced the shape of her recital. 'One time, as a child, I sang a song that my mum taught me in a concert at my school. I sang the song to my doll, and the words went: "I have one mum and one God". Of course, with the Communist system, the next day my father was put in prison. We were moved away from the city. 'It's funny though: certain things in my life have been very negative, yet if I hadn't gone through them, I wouldn't have been here. So yes, my father was moved to another city, but it was Iaşi, the capital of Moldova, and it was the greatest city in which my artistry could take shape. I was nine years old when we moved, which was very late compared to other people; they were at music school from being six years old. I had no instrument; all I had was musicality and an unusual voice. They accepted me at the music school, but I had to do two years in the space of one because I had to catch up. It was hard work, because they were very tough. So Miricioiu's programme for the recital at St John's combines both the optimistic and the sad aspects of her personality. 'An example of this is in the Donizetti song 'E morta', which is about losing your child,' she says. 'To me, it's more to do with a general sadness: it's about anything sad that happens to you. 'Another one is 'La Zingara' [The Gypsy], which has a connection with the sense of freedom that I always wanted. 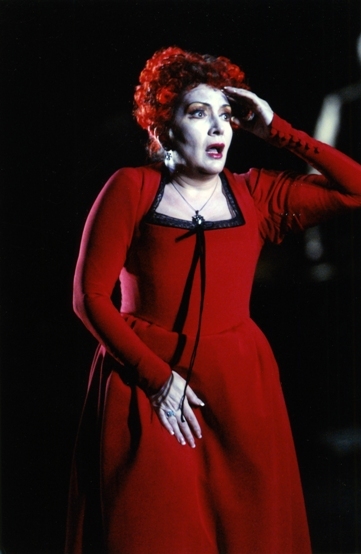 It's something I totally identify with – it's like I always wanted to do Carmen, I just didn't have the voice for it!' she laughs. 'I understand Carmen, because it's exactly what I feel. And it's a dilemma, because I was brought up very rigidly, with rules, yet I want freedom. I still feel a kind of imbalance, because I realise now that the sense of freedom is my spirit, but I've been too regimented to really allow my spirit to have that kind of freedom. It's something in the genes, I think. If you ask my son what he wants, he doesn't really know: he just wants freedom. My mother is eighty years old and still wants some freedom. And we still don't know what the hell that freedom is! It makes no sense to us, in a way. A perhaps surprising element of Miricioiu's programme is the inclusion of four of Lennox Berkeley's French songs. But the soprano's association with the Berkeley family goes back quite a way. 'I'm friends with Julian, Lennox Berkeley's son, and Tony, who is Julian's partner,' she explains. 'When I first came to the UK, I did Traviata in Scotland, and the costume designer was Michael Annals. When I finished the production, I came to London, and I was looking for a flat. I didn't have very much money and spoke very little English. I got myself some accommodation, but it was horrible and I called Michael the next day in tears and said "I can't stay here!" So Michael picked me up, and I stayed at his house. He helped me to find an apartment, which happened to be Tony and Julian's, because they were staying at Lennox's house. They charged me very little, and we became really close friends. The recital is completed by more familiar Miricioiu repertoire. 'I'll be singing 'Tu che la vanità' from Don Carlo, which is my favourite aria of all time,' the soprano says with enthusiasm. 'I always insist that the pianist plays the whole introduction, because for me it's the essence of the music. I can't tell you how deeply I feel about this piece. It's heaven! I'm also doing 'Grace, grace pour toi meme' from Robert le Diable because it's my husband's favourite – he adores it! It's funny, because I didn't expect it to be so successful. Every time I chose it, I did so because of him, but everyone seems to love it. 'I also have an aria from Macbeth, which is the latest development of my voice. Why do I connect with this opera? When I was growing up in Romania, I had to fight hard to survive: the government didn't allow you to have an individual personality. They kept telling me I was rubbish. I had to work hard to keep on believing: it really was my mother and my God that made me carry on. That's when I became very tough. My innocence and naivety permanently turned into hurt. I have something in my personality that makes me turn tough when I'm continually hurt. I'm like a blade at that point. That is Macbeth for me: it's like, "You bastards! You won't get me!" 'But then I feel guilty for it, so I need to redeem myself with Don Carlo!' she jests. 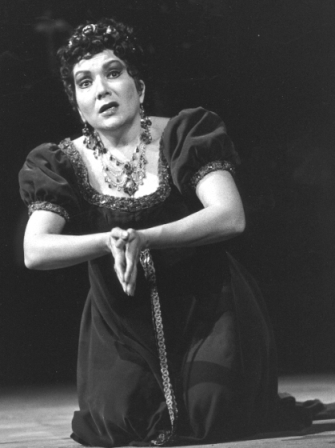 The soprano describes how she chooses the operas that she performs. 'With all my roles, I have to be able to identify with the characters. I can't be a false performer. 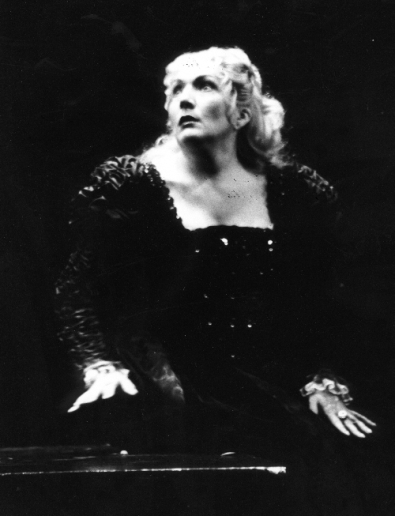 The two roles that were hardest for me were Respighi's La fiamma and Poulenc's La voix humaine. I was crying every day with La voix humaine: I could not understand that woman, and for me to sing artificially is a killer. I can't do it. I need to know that some part of me will connect. So although La voix humaine was hard musically, the fact that the character was too defeatist was much harder to deal with. I'm not that type of person: however low I go, I'll always survive. I also can't accept the fact that she's always saying, "Oh yes my darling, you're so right". She's so apologetic all the time. I did manage to find my way, though!' she adds with a smile of satisfaction. I ask whether there are any roles she's not done because she couldn't connect with the woman, and she says 'No. But I can tell you that I'm not greatly in love with Tosca, for example. What's interesting is that in the new score I've got of Tosca, it says that Puccini himself was not convinced by it. I know why I don't like it: musically and vocally, it belongs to a very mature woman, but the character belongs to a young girl. I find it very hard to put it together. Only when Tosca is a young woman does it make sense that she falls for Cavaradossi rather than Scarpia. Being young, of course you go for the idealist. But if it were me, I'd fall in love with Scarpia every time!' she giggles. 'I'd think, wow, this is the real man! So I have a problem there. Cavaradossi is just too weak. From 21 to 27 August of this year, Miricioiu will give a week of masterclasses at the Guildhall School of Music and Drama, preceded by a concert on 20 August. The soprano explains her approach: 'When I started to do masterclasses, I looked around at my colleagues and I could see that you just can't learn everything in a week. 'I'm not the type of person who wants to do masterclasses to make myself look clever or to show off: I really love my kids and I really want them to get something out of it. What I'm doing more and more – because I'm learning as I go – is to try and connect with everyone's personality, to inspire them to have confidence in their talent, to inspire them to search, and not to be stuck with just one teacher's knowledge. Every teacher has limitations, and as a student your duty is to find your way through. Yes, you have to know about technique, but you also have to promote your instincts. I don't just want to be like a textbook: the life element has to be there. Unfortunately, I've seen a lot of kids nowadays who are so obsessed with technical issues that they do it at the expense of art. I want something that has an energy, that doesn't stop. For me, technique on its own means that the energy has stopped. I want my kids to start looking at the words, and to understand why the music is there, why the pauses are there. So if I can trigger something that opens a door for them in that week, I'll be perfectly happy. 'Up to now, they seem to have responded beautifully to that, because I appeal to their natural gifts - their basic instincts - rather than to the voice. Of course, I give them knowledge too, and I base myself on the three golden rules: breathing, pronunciation and flexibility. You don't touch them. But I see so many children who have been taught with amazingly fixed ideas. My belief is that when they come to the class, the talent is there: I'm not going to make their talent. What I do is to see what their talent wants. I change things from one pupil to another, because certain things are not applicable to everybody. And in order to uproot something, I tend to exaggerate, to wake up the awareness. That's a lot more important than having fixed rules. Miricioiu admits that her own training is an ongoing process, and says that she feels very blessed. 'I had some things naturally that other people work years to get,' she declares with total sincerity. 'I had three octaves in my voice, so I had access to lots of things. I was lucky that the music school I attended in Iaşi offered an education of tremendously high quality. They had fabulous teachers: they were either composers, conductors or philosophy teachers. We had a very broad education, and I really benefited from that because it gave me an understanding of such a wide variety of subjects. We were trained so that we could go into a conventional career, if there wasn't a placement for us in music. That helped me, later on, to have an intellectual approach to my roles. 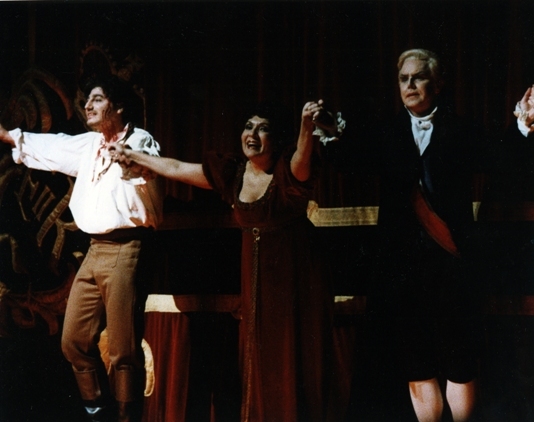 I also had a rich background in terms of the variety of styles and periods of music they introduced us to: it meant I could do lots of different kinds of roles in my operatic career. 'The passion of our teachers in Iaşi produced excellent results. My coach in Romania said, "I'm not going to teach you, I'm just going to make you aware of your voice". I ask about how Miricioiu established her operatic career, and she answers candidly: 'It wasn't too difficult, to be honest. I was a prodigy at five; I was on television at fourteen. I had my first competition at 22, then I won ten competitions and my career just built up very quickly. 'One of the competitions was in Ostend, and the winner – me! – got to perform in a television programme. Somebody in Amsterdam, Andrew Sharp, was watching television, and was amazed by my programme. He sent a tape of it to his friend Jenny Lee in London. She was the secretary of the agent Lies Askonas, and she really liked me. Having fled Communism, Miricioiu applied for political asylum in the UK. 'I was not allowed to leave England for a year and a half, so Lies managed to get all the conductors to come and audition me here in London, and I got all the contracts. When I ask what elements of her career she has been most proud of, Miricioiu's reply is perhaps surprising. 'It's not so much about the career,' she says, struggling with the question's premise. 'I take pride on how I behave as a human being. I take pride in not letting myself down. I never looked at my "highlights" in that sense. I admit that I was proud of La voix humaine, because I thought that if I could do it at 57 years old and not forget one word, it would be a true achievement! But everything else I have done out of passion. Pride has nothing to do with it – I don't even think about it. I work so passionately on my roles, and I work so hard, that all I want is to become one with the music. This has left Miricioiu with a sense of not belonging. 'I've just been to Romania to do a concert, a masterclass and Norma. You have no idea how depressed I was after the Norma. This was the first time I had a trip back to Romania where I re-established myself as a Romanian. I thought that would bring me a reunion in my own soul of belonging to where I came from. 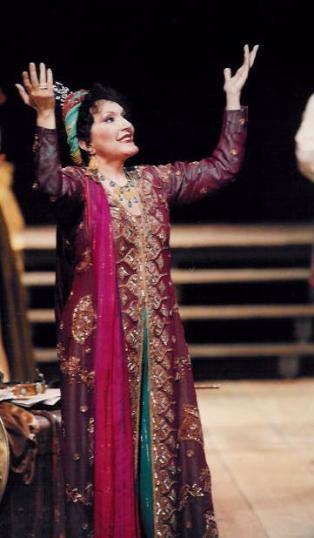 London audiences' next opportunity to witness Miricioiu in an operatic role is in her forthcoming appearance with the Chelsea Opera Group, on 21 February 2010. But after years of exploring rarities, the soprano is going to sing one of the most popular roles in the repertoire: Violetta in Verdi's La traviata. 'It wasn't my choice!' she says. 'I didn't know what to come up with. When the idea came up, I just thought, no, I'm too old. 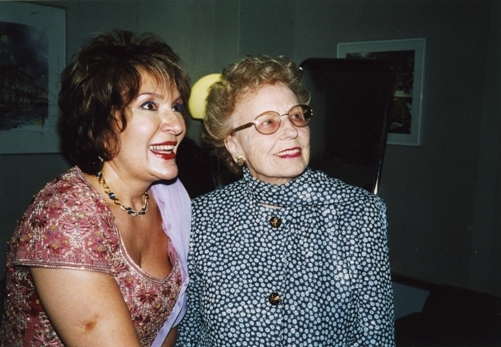 Though it's not been widely discussed publically, Miricioiu encountered vocal problems a few years ago when she was performing in Norma in Amsterdam. Her vocal crisis was a major setback for the artist. 'It was quite traumatic, because I'd had huge success for twenty years in Holland, and for the first time I cracked. 'It had a lot to do with my age and the problems it brings. But psychologically it had more implications. The one person that I know of who writes about vocal crises is Christa Ludwig, but otherwise singers don't talk about it; it's almost like a taboo. Maybe they don't discuss it because people don't quite understand. All I can say is that I started all over again from scratch, because unless you do that, whatever vocal crisis comes in – be it because of surgery, menopause, or whatever you went through – unless you drop everything and retrain the mind and the muscles, you can never find your way. 'It's like having an old dress: if you put a patch here and a patch there, it will always look patched. And the crisis will come back, because if you got to the point of crisis, it means that you've not identified the symptoms for some time and compensated by covering up all the time. Then you have a crisis, and your vocality has been spoilt. I was very aware of that, and I stopped, and began again on my own. It was not easy, and to rebuild mentally was more difficult than rebuilding physically. Nelly Miricioiu appears in recital with David Harper at St John's, Smith Square, London, on 20 May 2009, performing Rodrigo's Cuatro Madrigales Amatorios, Bellini's Mad Scene from Il Pirata and Bretan's Three Romanian Songs, plus works by Enescu, Ravel, Berkeley, Meyerbeer, Verdi and Donizetti. Telephone: 020 7222 1061. Pricing: £10- £25, concs available. Tickets can be booked at https://secure.sjss.org.uk. More information on Nelly Miricioiu, including a complete discography and details on forthcoming performances, can be found at her website: http://www.nellymiricioiu.com.